In this battle-royale, Lady Evil and her legion of villains break out of their mystical prison to wreck havoc on the world. Lady Justice summons a team of superheroes to stop their destruction among them is the powerful superhero, American Star who must battle Lady Evil and her minions. 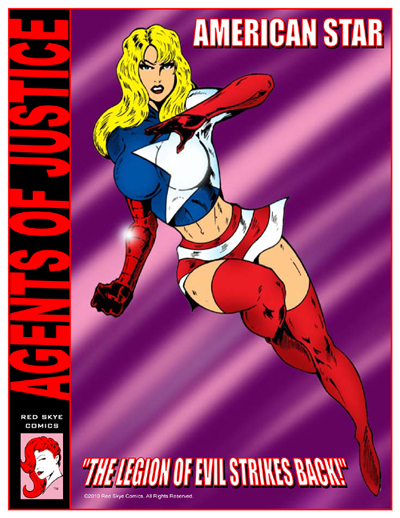 Agents of Justice: American Star featuring Leslie Ann Wall is 20 pages with full color cover and b/w interior art. About Leslie Ann Wall: I’m born and raised in Charleston, SC. I have modeled on and off for 9 years now. I have a sweet, bubbly and sassy personality and I definitely know what I wantJ I absolutely love creating art and meeting all the great people who share the same interest. I strive for the best and love the amazing results that follow along with it. Bikini and glamour modeling seems to be my favorite. I have done promotional modeling, been published in different hair magazines, was featured in Surpass Magazine and others, won the 2015 North Carolina Bikini Bash, am a Biker Babe and a Bliss Babe. Help Support the Leslie Ann Wall Page - You Can Donate Any Amount! ©2004-2018 Red Skye Media. All Rights Reserved.